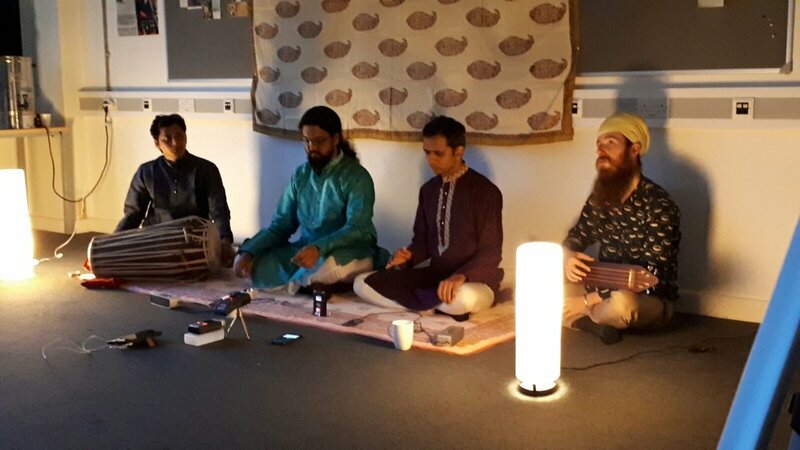 The Dhrupad Music Society is going from strength to strength. 2017 was a year of expansion and many firsts. For the first time we ran a residential course. This allowed a much deeper immersion into the music and a greater sense of participating in the guru-shishya parampara – the traditional style guru-student teaching. We had over 30 participants and had to split into two mixed-ability groups. To facilitate this, two of Udayji’s senior students, Chintan Upadhyay and Prassanna Vishwanathan, accompanied him and helped with the teaching. As this was a residential programme we were able to have a more varied programme. In the early morning Udayji and his students led highly popular sessions of ‘Kharaj’. This is a beautiful and meditative singing practice where you sing a single note for an extended period of 10 to 20 minutes or more. In India these sessions happen every day at around 4 or 5am! With a token to western sensibilities we started at 6:30am :-). A Master class in raga Malkauns with Udayji and his senior students. This was a tremendous concert in its own right and gave an excellent insight into how Udayji teaches at a higher level, with focus on the finer points of detail in the exposition of a raga. A Lecture-Demo on “Shruti – A meeting of Mathematics & Music”, by Shail Patel. This gave an insight into the mathematics of the fine differences in note known as ‘shruti’ (just intonation). Like last year Udayji was accompanied by Pratap Awad, a brilliant pakhawaj player, who supported us in our endeavours. Pratap also gave workshops and lessons in pakhawaj during the week. And in amongst all these exciting activities during the main day sessions Udayji also taught us paltas (exercises), alap (the most important first movement in a raga) and bandishes (song) with ‘improvisations’ in two beautiful ragas: Bhimpalas and Todi. This is the heart of the workshop as everyone learns something they can take away with them at the end of the event. And at the end of the week we re-instated an old tradition of a ‘performance’, and each group gave a rendition of what they had learnt to the other group.